Recipe for success . . . . .
After forty weeks together, my students have now all completed their first year studies. Friday; their last day, was spent catering for an exhibition showcasing the talents and work of the students on our Jade Carving programme (the only one of its kind in the world). However they do have to return on Monday morning for their International City & Guilds exam and then its their graduation ceremony on Tuesday morning. After that I am very happy and pleased to report that every, single one of them is graduating to leave to go straight into positions. Every year our graduants seem to get snapped up by the industry. To add icing on the cake, the programme for next year is already full and applications are still flooding in, its a pity we can only take twenty each year. A very successful year it has been then. So its all up to you now . . . remember, now is the time that you will really start to learn. After twenty years plus I am still learning and I hope you will too . . . bon chance et bon voyage mes amis. Many of you will have had mussels Mariniere (Mariner style) when you have gone out to your local restaurant, so this week I am going to tell you how to prepare them yourself at home. Some of you, like me, love to walk the shores and collect your own mussels, those of you not so fortunate will have to rely on your local fishmonger or supermarket. European black mussels are fine but far too small for my liking. All the better of course if you can find the New Zealand Greenlip mussels; they are huge, very tasty and readily available world-wide now. They are farmed here in New Zealand, in the pristine waters of Aotearoa and from all accounts full of great nutrients, so not only taste great but are good for you! Ever noticed and wondered why you get white and orange fleshed mussels? Well the orange ones are female and for my liking a lot sweeter than the white male ones which can have an earthy taste to them. Of course you dont know which are which until you cook them and they open up, so there is a surprise just awaiting you in each one . . . 'quelle surprise' as they say in France or 'eine Überraschung' as they say in Germany. Eat with your fingers and be sure to serve some baguette (French bread) with it to soak up the sauce! Bon appetite! This is a traditional French method of cooking mussels, the classical recipe does not use cream but the mussels are served only with the reduced cooking liquor thickened by whisking in cold butter or other thickening agent: beurre manié. Frozen, pre-cooked half shell mussels are fine for this recipe, but when purchasing live mussels be sure to check them all. If any are open, then tap the shell. They should close up, if not, it means they are dead and should be discarded. 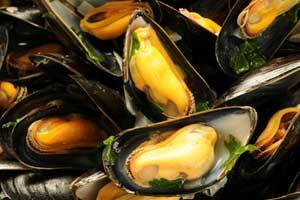 Enjoy your mussels and bon appetit . . . . .